How will new Russian media ownership law affect foreign players? Last year, the Russian president signed a law restricting the share of foreign ownership in any Russian media to 20 percent. Under the new law, media owners have until Feb. 1, 2017 to comply with the new requirements by making the necessary structural changes. RIR looks at how the law will affect players on the media scene and what options are open. Back in October 2014, Russian President Vladimir Putin signed a controversial law restricting the foreign ownership share in any Russian media to 20 percent. Under the new law, media owners have until Feb. 1, 2017 to either “adapt” their ownership structure to the new requirements or leave the Russian market. “Its purpose is clear: to defend national sovereignty,” said State Duma speaker Sergei Naryshkin, commenting on the bill, which passed through the lower house of the Russian parliament in a matter of just a week. “He who owns information owns the world,” said the authors of the draft law. One of them, first deputy chairman of the State Duma’s information policy, information technologies and telecommunications committee Vadim Dengin, was more than once quoted in media reports as saying that since “a huge information war was under way,” this bill was a matter of information security. In addition, it is aimed at the “deoffshorization” of the media market as too many media outlets are run from offshore zones and it is often not clear who is behind them, said Dengin. Media outlets with foreign ownership have been given until Feb. 1, 2017 to bring their ownership structure in line with the new regulations, although the law itself comes into force starting from 2016. Ideas to introduce these restrictions had been around for a number of years. The threshold of 50 percent for foreign capital, which was adopted in 2012, had been discussed since 2001. In the end, those restrictions did not apply to printed media, only to TV channels and radio stations. The new amendments introduce a cap of 20 percent for all types of media that have a license. Justifying their decision, deputies cite international practice and say that they do not expect that the new amendments will result in a redistribution of the market or the closure of individual projects. According to Dengin, deputies insist that media outlets have numerous ways of “legalizing” themselves. “For example, through establishing a Russian legal entity or operating by franchise,” he told the RIA Novosti news agency in October 2014. Between the moment these amendments were submitted to the Duma and their signing by the president, the value of shares in Sweden’s ModernTimesGroup (which owns the TV 1000 and Viasat History channels, as well as several other TV channels that broadcast in Russia) fell by 20 percent on the NASDAQ OMX. By the end of 2014, the shares of its majority shareholder, the STS Media holding company (registered in Delaware, U.S.), hit a five-year low and cost just $4.78 on NASDAQ (a drop of 64 percent compared with early 2014). Having said that, other Russian companies in the telecom, media, and IT sector have also suffered a similar dramatic decline, though in their case the slump has been caused by the economic crisis, a source at a media holding company with foreign ownership, who asked to remain anonymous, told RIR. “Many players are now looking for a solution that would be best for their shareholders. We are under close scrutiny from everybody: from the U.S. regulators, from the Russian regulators, from investors, so any premature disclosure of information is fraught with consequences,” he said. The STS Media press service told RIR that the adopted amendments “create a considerable uncertainty” for the holding company and its shareholders. The list of potential options includes: corporate restructuring, franchising and licensing of structural units, capital reorganization and a sale of assets, from partial to complete. However, no choice has yet been made. Technically, shareholders do have numerous ways out, since the law “is extremely muddled in its wording,” a partner with the Board of Media Lawyers, Fyodor Kravchenko, told RIR. The 20-percent cap is imposed on foreign ownership only in those companies that are an editorial office or a founder of a media outlet but the restriction does not apply to, for example, another legal entity such as a publisher. 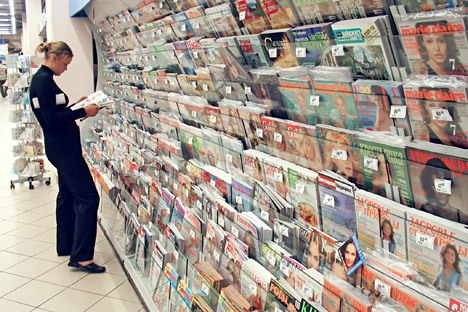 This means that a foreign owner can distribute the print run either through retail sales or through subscription, can sell all advertising in the media outlet in question, i.e. in effect, can have full control over all cashflows and all of the media outlet’s revenues, Kravchenko said. However, in his view, the desire of foreign owners to look for loopholes is much more affected by the vague wording in the law that bans “indirect control” over Russian media from foreign individuals. According to Kravchenko, this gives unchecked powers to the law enforcer. “For example, if Forbes hands over its trademark for use by a Russian publisher, will it give them an opportunity to ‘indirectly’ control the editorial team? Of course it will. The trademark owner who has spent their resources on developing the brand would want to retain the right to control how the Russian editorial team adhere to the established standards,” explained Kravchenko. Even this indirect control can be interpreted by the authorities, should they choose to do so, as a violation of the law, he added. “We are already seeing a redistribution of ownership in the print media,” said Kravchenko. According to him, at least a third of major foreign owners will decide not to get involved in these games. The others will choose to adapt to the new conditions. “From what I’ve heard in conversations with colleagues, no-one in the publishing business intends to leave Russia, in the press the intention is also to stay,” president of the Hearst Shkulev Media holding company Viktor Shkulev told RIR.